SINGAPORE - A new road map plotting the growth of the infocomm media (ICM) industry is expected to create 16,000 jobs by 2020. Most of these are expected to be professional, managerial, executive and technician roles in four frontier areas: cyber security, Internet of Things, immersive media, and artificial intelligence (AI) and data science. Announcing these projections with the launch of the ICM Industry Transformation Map on Friday (Nov 3), Minister for Communications and Information Yaacob Ibrahim said: "The ICM sector itself shines brightly in Singapore's future economy." Specifically, the sector's value-add is expected to grow at 6 per cent annually, almost twice as fast as the overall economy, and employing a total of 210,000 workers by 2020. 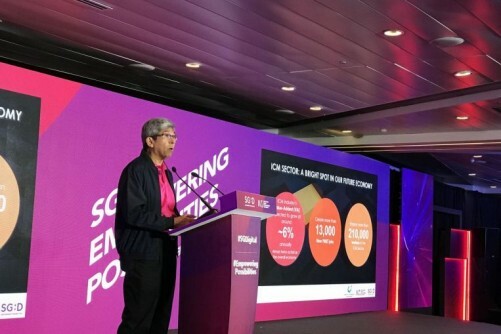 "This presents immense opportunities for both companies and workers in the ICM sector, and stands in stark contrast to the larger backdrop of the global slowdown," said Dr Yaacob at the Infocomm Media Development Authority's (IMDA) first anniversary celebrations at Suntec Singapore Convention and Exhibition Centre. To meet these targets, IMDA will be investing in infrastructure building and manpower training in the four identified frontier areas, beginning with AI. The authority will launch an AI apprenticeship programme to provide on-the-job or course training for the first batch of 200 AI professionals over the next three years. The programme is a first for AI under the IMDA's tech skills development and job placement initiative called TechSkills Accelerator (Tesa). Launched in April last year, Tesa has since trained 16,000 professionals in new tech skills to prepare them for the digital economy. Such an economy is envisioned to be highly automated through the use of predictive tools to recommend products that customers might like, based on browsing or purchasing patterns, or virtual reality tools to train doctors in surgical procedures. More details will be announced later, with new funding for AI from IMDA, in addition to the $150 million already announced by the National Research Foundation in May this year. Two new AI companies - United States-based DataRobot and locally based Taiger - have also been approved under the Accreditation@IMDA programme, which will be renamed Accreditation@SG Digital, to reflect its expanded national agenda. The two firms add to an existing pool of six accredited AI companies. First launched in October 2014, the scheme aims to help start-ups expand overseas and give them a foot in the door when they apply for Singapore government tenders. To help speed up the development of speech-enabled applications for local use, there are also plans to create an AI library containing the national speech corpus in English. The speech corpus in local accents is slated for launch in the third quarter of next year. It is modelled after similar ones in Japan, Finland and the Netherlands. One advantage is that start-ups need not collect voice data themselves, but they will be able to develop voice apps that understand or correctly pronounce terms such as "nasi lemak", "Ang Mo Kio" or "Tampines". Through these efforts, it is hoped that local companies can grab a slice of the burgeoning global speech and voice recognition market, tipped to be worth US$18.3 billion (S$25 billion) by 2023.